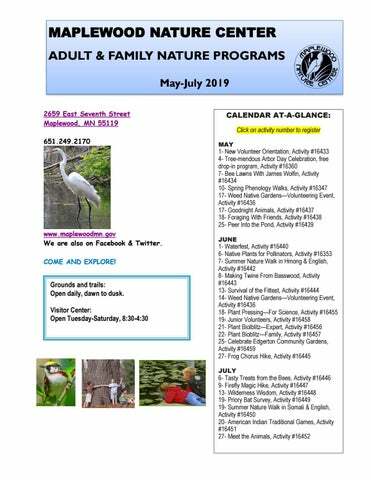 1- New Volunteer Orientation, Activity #16433 4- Tree-mendous Arbor Day Celebration, free drop-in program, Activity #16360 7- Bee Lawns With James Wolfin, Activity #16434 10- Spring Phenology Walks, Activity #16347 17- Weed Native Gardens—Volunteering Event, Activity #16436 17- Goodnight Animals, Activity #16437 18- Foraging With Friends, Activity #16438 25- Peer Into the Pond, Activity #16439 www.maplewoodmn.gov We are also on Facebook & Twitter. COME AND EXPLORE! 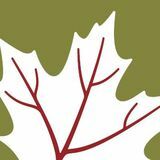 Register online for paid or free programs www.maplewoodnaturecenter.com then click on the Register Online-Go! button. You can also register in person, phone, 651-249-2170, or mail with credit card, cash or check by the date indicated. Program sizes are limited, register early. No need to register for Drop-in programs. Most programs are held at the Maplewood Nature Center unless otherwise noted in program description. 9:00AM–10:30AM Hike with a Naturalist to study and record wildlife observations during the current season. Meet a live native animal! Indoor activities if rainy. This entire program will be translated into Hmong. Learn new nature words in multiple languages. All language speakers welcome. Translated into Hmong & English Friday, June 7. Free! Register online by June 6. Translated into Somali & English Friday, July 19. Free! Register online by July 18. Translated into Spanish & English Friday, August 9. Free! Register online by August 6. GOODNIGHT ANIMALS (CHILDREN AGES 3-6 WITH ADULT) FRIDAY, MAY 17, 6:30PM-7:30PM Cozy up with your favorite stuffed animal and pajamas while you learn how animals get ready for the night. Take a short hike outside to find signs of animals, then, back inside, listen to a bedtime story. Pajamas and stuffed animals encouraged! Bring sturdy, close-toed shoes for outdoor hike. Fee: $5 per child Register online by Thursday, May 16. FORAGING WITH FRIENDS (ADULTS, TEENS 14 AND UP, SINGLES) SATURDAY, May 18, 2:30PM-4:00 PM Learn when, where and how to safely forage in a sustainable manner. We’ll find and taste some of our healthy, common wild edibles, share recipes, learn how to avoid chemical exposure, poisonous look-alikes and conflicts. Fee: $4 per person. Register online by Wednesday, May 15. PEER INTO THE POND FAMILY (CHILDREN 5+ WITH ADULT) SATURDAY, MAY 25, 2:00PM-3:30PM Catch, identify and release snails, water bugs and minnows from our 600 foot floating boardwalk. View them live under our TV video cam. Is our pond healthy? Find out the answer. Free! Register online by Friday, May 24. MAKING TWINE FROM BASSWOOD (FOR ADULTS & FAMILIES WITH KIDS AGE 5+) SATURDAY, JUNE 8, 10:00AM–11:30AM Learn how to create twine and rope from the inner bark of the basswood tree. Watch a demonstration of how to collect and harvest the bark, then make enough twine for a small project to take home. Use a pump drill to drill holes in shells for your creation. Some materials provided. Bring shells from home or use up to 4 from the nature center. Fee: $5/person Register online by Thursday, June 6. SURVIVAL OF THE FITTEST (FOR CHILDREN AGES 8-12) THURSDAY, JUNE 13 1:00PM-4:00 PM Do YOU have what it takes to survive? Learn and try out survival skills about plant identification, shelter building, and building a campfire. S’mores provided. Wear sturdy, close toed shoes. Drop off program. Parents must sign a waiver. Fee: $10/child Register online by Monday, June 10. PLANT PRESSING - FOR SCIENCE! (For Adults and youth 14+) TUESDAY, JUNE 18, 3:30PM–4:30PM Learn how to collect and preserve botanical specimens for herbarium records and identification purposes. What collection equipment will I need? What plant parts are needed? How do I press to prevent damage and color loss? What other information should I record? How do I submit a specimen to a herbarium? Bring your own plant press if you’d like to press a sample to take home. Highly recommended for plant blitz participants. Free! Register online by Sunday, June 16. PLANT BIOBLITZ FAMILY (FOR ADULTS AND CHILDREN AGES 6+ WITH ADULT) SATURDAY, JUNE 22, 10:00AM - Noon Become scientist for a day! Join experts, for hands-on learning in the field. Learn about the importance of species diversity and how you can help protect nature. Meet a carnivorous plant and a potato that grows in the water! Use field guides, nets, binoculars, and a plant press to help generate a species list. Surveys will be off trail. Long pants and sleeves, water-proof footwear, hats and eye protection are highly recommended. Free! Register online by Thursday, June 20. FROG CHORUS HIKE (ADULTS & CHILDREN AGES 7+ W/ADULT) THURSDAY, JUNE 27, 8:00PM–9:30PM Join us for an evening hike to listen to frogs and other night noises! Learn about local frog species, their calls; then hike to try our new identification skills. Fee: $5 per person. Register online by Tuesday, June 25. FIREFLY MAGIC NIGHT HIKE (FOR CHILDREN AGES 4-10 WITH ADULT) TUESDAY JULY 9 8:30PM–10:00PM Early registration recommended. Fireflies are magical bugs with a built-in night light. Learn how and why they light up, and take a hike in search of them. Listen to a firefly story and make your own glow-in-the-dark firefly to take home. Fee: $5/child. Register online by Sunday, July 7. WILDERNESS WISDOM (FOR ADULTS & CHILDREN AGES 7+, WITH ADULT) SATURDAY, JULY 13, 10:00AM-11:30AM Discover how to have FUN AND be safe outside! Discover which wild berries are safe to eat, find Jewelweed-the antidote to stinging nettle; Make a poison ivy rubbing; learn how to identify wild parsnip. Get tips and tricks for preventing ticks and mosquito bites; your own “ticker” tape and tick remover. Fee: $5/family. Register online by Wednesday, July 10. PRIORY BAT SURVEY (FOR ADULTS, SINGLES, & CHILDREN AGES 7+ WITH ADULT) AT PRIORY PRESERVE, MAPLEWOOD FRIDAY, JULY 19, 8:30PM–10:15PM Hike the trails at twilight to listen for bat clicks and chirps with our electronic echolocator. Help identify and record species flying over the preserve. Fee: $4/person. Register online by Wednesday, July 17. AMERICAN INDIAN TRADITIONAL GAMES (ADULTS, OR AGES 5+ WITH ADULT) SATURDAY, JULY 20 10:00AM-11:30AM Learn about and play games of skill and chance from Ojibwe, Dakota, and other American Indian Traditions. What a fun way to learn about cultures! Games may include the Cherokee Bean Dice Game, Deer Toe Bone Game, Double Ball, Lacrosse, and more. This program is great for families, individuals, or for teachers that want to incorporate these games into their classrooms. Presented by the American Indian Department, ISD 622. Fee: $5/person. Register online by Thursday, July 18. MEET THE ANIMALS (FOR ALL AGES) SATURDAY, JULY 27, 2:00PM-3:00PM Meet a snake, salamander, and toad, to learn more about Minnesota’s wild animals and where they live in the summer. Share your stories about real wild animal encounters; make a slithering craft, have a hoppy time! Free. Register online by Friday, July 26. POLLINATORS & GARDENING BEE LAWNS WITH JAMES WOLFIN (ADULTS) AT MAPLEWOOD NATURE CENTER TUESDAY, MAY 7, 6:30PM-7:30PM A bee lawn provides natural diversity, beautiful flowers, food for pollinators, reduces mowing, fertilizing, watering, and increases resilience to seasonal drought. Learn about James Wolfin’s research at the University of MN on the types of bees that visit these plants, and how to install and maintain a bee lawn. Great for gardeners, homeowners, townhome associations, Master Gardeners, Master Naturalists, and those who want to support pollinators! Fee: $5 per person. Register online by Thursday, May 6. NATIVE PLANTS FOR POLLINATORS (ADULTS) THURSDAY, JUNE 6, 700PM-8:30PM Learn how to start gardening with native plants to provide native bees and butterflies with what they need to thrive. Tour the gardens at the Nature Center, watch a planting demonstration, take home twelve native plants to get your garden growing. Fee: $25/ person. Fee includes a starter set of 4 different native plants, 12 plants total. Register online by Tuesday, June 4. TASTY TREATS FROM THE BEES (FOR CHILDREN AGES 4-10, WITH ADULT) SATURDAY, JULY 6, 10:00AM-11:30AM Taste different kinds of honey, and sample food pollinated by bees such as blueberries and raspberries! Learn about different kinds of bees and why they are important. We’ll do a fun and easy bee-count, Minnesota Bee Atlas project at iNaturalist.org, that you can also do in your own backyard or nearby park. Fee: $5/person. Register online by Friday, July 5. VOLUNTEEERING EVENTS NEW VOLUNTEER ORIENTATION (AGES: ADULT, YOUTH & FAMILY) WEDESDAY, MAY 1, 3:30PM-4:30PM It’s FUN to be a regular volunteer at the Nature Center and Neighborhood Preserves! Sign up for volunteer events separately or come to this orientation to find out about all the cool opportunities: Trail guide; Program Aide; Receptionist; and Animal Care, Citizen Science monitoring, and Gardener: native gardens and at the community vegetable garden. Free! Pre-register online by Tuesday, April 30. Adult regular volunteers must pass a background check. Call (651) 249-2173 for more information. WEED NATIVE GARDENS (ADULTS) AT MAPLEWOOD NATURE CENTER FRIDAY, MAY 17, 10:00AM-11:30AM FRIDAY, JUNE 14, 10:00AM-11:30AM Experienced and new gardeners wanted. Help weed the native wildflower and pollinator gardens. Learn to identify at least four native plants and four weeds, receive answers to your native gardening questions. Receive a certificate that shows your service hours. Free! Pre-register online by Thursday, May 16 & Thursday, June 13. PLANT BIOBLITZ (ADULTS) AT MAPLEWOOD NATURE CENTER FRIDAY, JUNE 21; 9:30AM–12:30PM Are you an experienced field botanist? Then we want YOU! Work with other experts, to help identify, record and generate a species list. Download the iNaturalist smart phone app or hand-record observations. Most work will be off trail. Long pants, closed-toe footwear and tall socks are highly recommended. Light refreshments. Prerequisites: Can identify both Minnesota native and non-native plants; can crouch, bend, and maneuver on uneven terrain; experience using a dichotomous key; Free! Register online by Friday, June 14. JUNIOR VOLUNTEERS! FOR AGES 10 – 14 (AGES 14-16 MAY APPLY TO BE ASSISTANT LEADERS) DATES: WEDNESDAYS, JUNE 19, 26, JULY 10, 17, 24, 31, Aug 7. TIME: 9:30AM–11:15AM Discover nature, seek new discoveries, and take some action! Make new friends and learn outdoor skills - cook with a solar oven, identify poisonous and edible plants, care for live animals. Use hand tools to clear trails, plant and maintain wildflowers. Projects take place at the nature center and nearby nature preserves. Long pants and closed toed shoes required. Celebrate with a popcorn party on the last day. Co-sponsored by Friends of Maplewood Nature. Fill out waiver and return to nature center by Tuesday, June 18, in order to participate. Fee: $25 (5 scholarships available please call 651-249-2170 to inquire). Register online by June 18. Did You Know-- that you can directly support Maplewood Nature Center and Neighborhood Preserve special programs and projects by donating online? The Friends of Maplewood Nature is a 501 C3 non-profit group that promotes awareness of and fundraises for the nature center and preserves. • It’s simple and easy- simply go to the Friends website https://friendsofmaplewoodnature.wordpress.com and click on “donate”. This will take you to the GIVEMN.org website where you will have several options for amounts. • You may also mail in a donation by sending a check written out to the Friends to the Maplewood Nature Center, 2659 E 7th St., Maplewood, MN 55119. If you are interested in becoming a Friends of Maplewood Nature board member call 651-249-2170. Friends have supported the nature center by co-sponsoring speakers for programs, such as live raptors for the Outstanding Owls event; special events such as the Outdoor Expo; exhibits such as the Solar Display and the Energy Bike; the new entrance sign; items for the play yard, and much more. FAMILY NATURE PACKS Check out a nature backpack at the front desk. These packs include: *Trail map & Bingo Hike sheet. *Binoculars & Hand lenses *Containers for pond study *Trail/wildlife guides Have Fun Exploring Nature!